We have a friend who raises Buffalo. He has an incredible ranch and a handsome herd. The other day we were able to get together for a delightful lunch. At the end of lunch, much to our amazement and delight, he presented us with a box full of bison meat! What a bonanza! 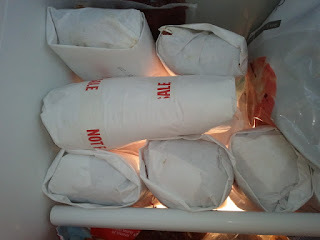 We now have ground bison, bison tenderloin and roasts. What a gift! This is a bountiful gift of health. Bison meat is so good for us. It is lean and not artificially infused with color (it naturally has a deep red coloring) or other preservatives. Can't find a better source of protein. Now you can find bison meat in your local grocery store. Not only at Whole Foods but also at Safeway and Costco. We have already done a Bison Chili just by substituting the regular ground beef with bison ground meat. It was delicious! We are looking forward to trying out more ways to use Bison. So fun! So Much for Thinking My Knee was Healing! Making it a Happy and Healthy Valentine's Day!